I moved to Brooklyn from Peru 14 years ago. As I recall, I arrived with 5 suitcases, a baby, a husband, and a cat. Now, a divorce, another marriage, 2 cats, 3 apartments, 5 jobs, and 8 marathons later, there have been only two constants: my amazing daughter. And the Cyclone. 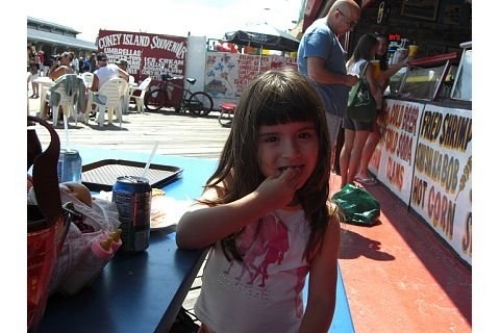 I don't have a photo of us at the Cyclone, but here's my girl sitting right across from it one June morning a gazillion years ago. Or maybe just 9. But it feels like a gazillion. For those of you who don't know, the Cyclone is one of the world's oldest roller-coasters. It feels a bit like it's put together with Duct tape and staples, in part because it actually might be: Duct tape was invented in something like 1902, and the Cyclone didn't open until 1927. But, y'all, it opened in 1927! The Cyclone is 90 years old this year! For me, the Cyclone is the place I go when I'm happy, sad, confused, or just generally emotionally overwhelmed. I went there on my 40th birthday with a close friend, and in my recollection we were at the top of the ride when I told him I'd found a knot in my breast (it later turned out to be benign). I went there alone on a foggy summer night after dark when all my things were in storage and I was flying out to Iraq for research the next morning. I think I took 4 rides that night. I went there on the day my daughter graduated from elementary school, and we whizzed around and around and laughed till it hurt. If there aren't too many people waiting on line, they'll let you ride as many times as you want, just keeping your seat while other patrons file in and out. Or at least they used to. They'd obviously charge you a ticket each time, but they lowered the price a bit every ride. One time when I was really sad I made it around 6 times, and by then the ride was just $1. I think they figure no one can stand it more than 5 times in a row. To be honest, the sixth ride did connect me directly with my survival instinct. Sometimes that's a really good thing. Aight, I'm done with the trip down memory lane, except to say this: if you are in New York City and you haven't been on the Cyclone, you need to go now. Contrary to popular belief, Duct tape doesn't last forever, and last time I went I saw a few staples coming out. Now's the time! Also, don't forget that you can get these ramblings directly to your email by signing up on our website. Super bright and happy yoga-wear, y'all. You know you want it!